It’s a dark month for gay lady comic book fans. Almost as soon as “Fearless Defenders” delighted us by adding a brand new lesbian character to the title, Marvel announced that they are canceling the book. And after a very public battle with DC editorial, “Batwoman“‘s creative team has now published its final issue. 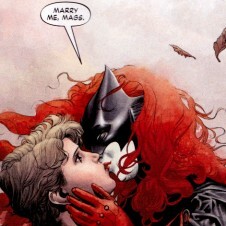 What did you think of “Batwoman #24”? Are you looking forward to the new creative team, or are you feeling as skeptical/bummed as I am? Posted October 30th, 2013 & filed under Entertainment.